Greg was born in Galway, Ireland, which is home to the Banshee. That explains why Greg yells and screams so loud when he’s playing the drums. Not only that, but sometimes it’s as if leprechauns are controlling his hands, forcing him to tap and dance on anything and everything. Greg was raised in a musical family, and started paying drums when he got a drum set for Christmas at age 12. 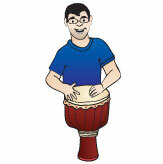 Greg has been privately teaching drums for almost eleven years. On top of giving private lessons, he also records music for films, commercials, and for fun. Greg has toured North America extensively in several bands opening for national acts. Liam started his musical journey on upturned buckets on his bed and quickly moved on to a drum kit in his parent’s basement. Since then he has incorporated tons of other instruments from every corner of the universe: from African Kalimba to Guatemalan Marimba; from American Guitar to Indian Sitar; from German Accordion to Martian Quaggborglion. Liam has released 4 albums with 3 different bands and toured across Canada several times. He loves to write music with his friends and believes that music can teach and connect us all. Having graduated with a degree in Physics, he has spent countless hours attempting to calculate the perfect beat. Liam loves to play music outside, ideally jamming with the yaks on mountaintops, or under the sea with the squids. He is honored to share his love for music with all the Mystic Drumz friends and critters. Ken is a tapper, he loves to tap out rhythms on a table, on a chair, on the bus, in a car or a train, He will tap with his spoons, hands, sticks, rocks, paper or scissors. One day, Ken wasn’t paying attention to what he was tapping on and he thought is sounded really good – he realized he was tapping on a small drum. No one told Ken there were instruments made just for tapping. 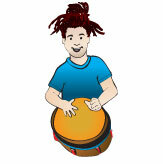 There are Boom and bang tapping things that have different drum names like Djembe, Bongo and cuicas and there are ding and bong tapping things like cowbells, triangles and xylophones. Since then Ken is having even more fun tapping on things. The only thing he can not do is TAP DANCE. 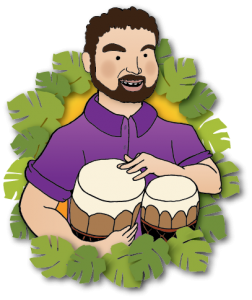 Ken had worked with children for over twenty years and currently lives in Ottawa where, if he isn’t tapping, he is helping people organize festivals and other fun events.